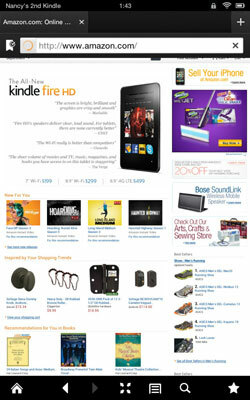 Amazon Silk is Kindle Fire HD’s web browser. Silk is simple to use, but the real benefits of Amazon Silk are all about browsing performance. Amazon Silk is touted as a “Cloud-accelerated split browser.” In plain English, this means that the browser can use the power of Amazon’s servers to load the pages of a website quickly. Because parts of the process of loading web pages are handled not on your Kindle Fire HD, but on servers in the Cloud, your pages are supposed to display faster. In addition, you get what’s called a persistent connection, which means that your tablet is always connected to the Amazon Internet backbone (the routes that data travels to move among networks online) whenever it has access to a Wi-Fi connection. The Kindle Fire HD 7-inch and 8.9-inch models can connect only via Wi-Fi; the 8.9-inch Kindle Fire HD 4G LTE Wireless model is the only one that has Wi-Fi access and 4G LTE access, so it can connect to a cellular network just as your mobile phone does. Another touted ability of Silk is the way it filters content to deliver it faster. Say you open a news site, such as MSN or CNN. Obviously, millions of others are accessing these pages on the same day. If most of those folks choose to open the Entertainment page after reading the home page of the site, Silk essentially predicts what page you might open next and pre-loads it. If you choose to go to that page, too, it appears instantly.